Spaces for the living and the dead. Death is terrifying. The idea of becoming obsolete, ceasing to exist, is not a pleasant thought. We die, we’re buried and we can only hope to live through the memories of those who knew us well. Cemeteries reflect this ideology perfectly. While each cemetery is unique there is unmistakably a common thread winding through them all, they are places to go and grieve. But how often do people actually visit cemeteries? And what becomes of the grave when those who remember die? Cemeteries are dead spaces for dead people. Assistens Cemetery turned preconceived notions on their head. While Copenhagen shines on many levels, it is quite odd that a cemetery in the middle of the city could warrant such buzz. This place is not just for the dead, it is for the living. People filter in and out unfazed that they are in a graveyard. 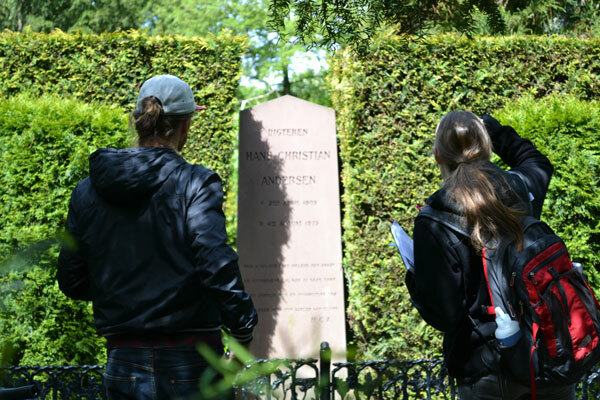 A place where the flowers bloom while people picnic and parents take their children on afternoon strolls – the “park” seems to be plucked out of a fairy-tale dreamt up by the late Hans Christian Andersen, who coincidentally happens to be buried in Assistens. Why is this cemetery different, why does it function this way? The answer may seem cheap, but sometimes a phenomenon has an answer as simple as people do what people do. I biked through the cemetery because it was a nice escape from the street AND because I had seen people biking through the cemetery before. My friends and I would also walk and picnic there for leisure. Why? Because we had seen others do it. One day I asked a woman walking with her infant why people used the graveyard this way. She shrugged and politely told me she had no idea. She had recently moved in across the street and saw others walking their children and dogs through the space, so she too began to walk the grounds. There is no sign stating: This is a park! It is people using it and inadvertently saying, this is a park too. Why give the deceased a forever home and then abandon them? Can cemeteries reintegrate themselves into the city? Assistens Cemetery reminds us that there is life after death and celebration in remembrance. The living using the park brings life to the dead, they are connected. It’s time to stop making dead spaces for dead people because there is nothing worse than dying and being forgotten about.